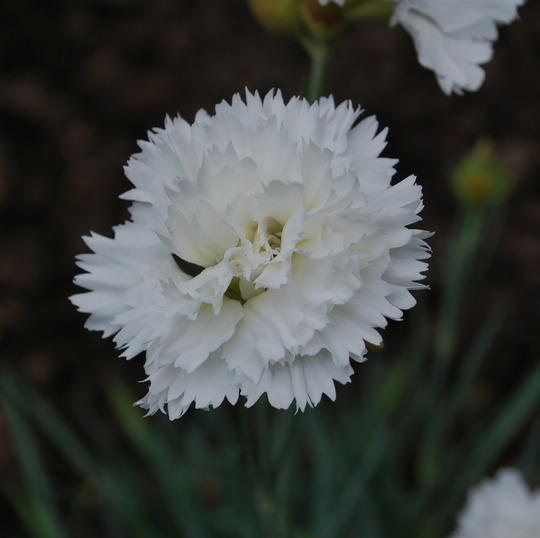 Bought this Dianthus last week, just beautiful……..
Last summer at the National Plant Show, Dianthus Memories (‘WP11 GWE04’) won the award for the Best New Plant Introduction. Having won the top award at a trade show, recently it was a deserving runner-up in Chelsea’s Plant of the Year competition. The journey began eight years ago when Whetman Pinks, the world’s top breeders of new garden pinks, dissatisfied with the faults of the old cottage garden favourite ‘Mrs Sinkins’, decided it was time to create an up-to-date replacement. At the Chelsea Flower Show last week Caroline Bourne, of Whetman Pinks, explained. “There’s a very famous Dianthus variety called ‘Mrs Sinkins’ which was raised in 1863 the Master of the Slough workhouse. At Whetman Pinks 150 years later we’re raised a modern version of ‘Mrs Sinkins’ compatible with 21st century demands. “This plant, bred in 2004, has undergone extensive trialling to provide us with a plant that is pleasing to the eye, fills our noses with beautiful fragrance, is easy and satisfying to grow and repeat flowering. It’s versatile, it can be grown in pots, containers, borders, or up the garden path. It’s repeat flowering, naturally compact, about 12in/30cm high, it’s extremely hardy to frost and heat, drought tolerant, easy to grow in a well-drained sunny situation. Quote from Graham Rice……Garden writer, and plantsman, writes very interesting blogs….. Here is a photograph of Memories and it is everything that one could want from a Dianthus, wish you could smell it!! Although I did not buy this plant from Whetman I have bought several plants from them, I like to buy from the breeder if at all possible. Next post: ENJOYING THE RAIN.........NOT REALLY? Especially lovely as it isn't too tall. I had some gorgeous hot pink ones that had the most fantastic scent, but they would flop over all the time. The flowers were too heavy for their stems. Interesting background info A. Thank you! Lovely flower as you say the scent makes the difference. Bjs thanks......Niverdeen they do mail order,I have bought from them, as I prefer to buy from the breeders if at all possible.....they have an excellent collection. I am becoming obsessed with Dianthus. Haven't got this one so will have to get it and it's for such a good cause. BA it is coping well considering......HB you will love it such a powerful aroma. Need some short plants for the front of the border - this sounds ideal (I always prefer to have plants that have scent! Me too Phs, and it helps the cause, we need to find a cure for this crippling disease.